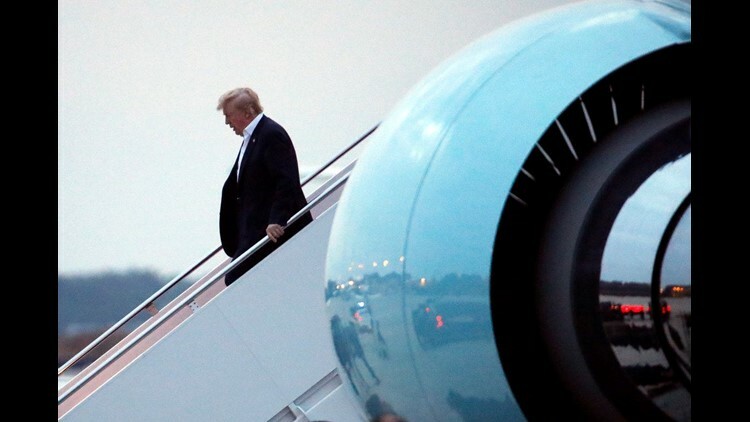 President Donald Trump steps off Air Force One as he arrived Wednesday, June 13, 2018, at Andrews Air Force Base, Md. President Donald Trump claimed that "there is no longer a nuclear threat" from North Korea after arriving back in Washington from Singapore where he met with Kim Jong Un for a historic summit. Trump landed at Andrews Air Force Base early Wednesday and fired off a series of tweets about the meeting. "Everybody can now feel much safer," he said. "Before taking office people were assuming that we were going to War with North Korea. President Obama said that North Korea was our biggest and most dangerous problem. No longer." Trump's optimism for what the summit achieved comes amid skepticism from his critics on whether he gave away too much in return for too little by agreeing to share a stage with Kim, a known human rights abuser whose regime has failed repeatedly to live up to diplomatic promises. Trump and Kim signed a joint statement in which North Korea pledged to denuclearize, but there are few specifics on how and when that would happen. Much of the text repeated vows to work toward a denuclearized Korean Peninsula. U.S. allies Japan and South Korea were concerned that Trump agreed to halt American military exercises with South Korea, which North Korea has long claimed were invasion preparations. Japan and South Korea have large U.S. military presences in their countries. 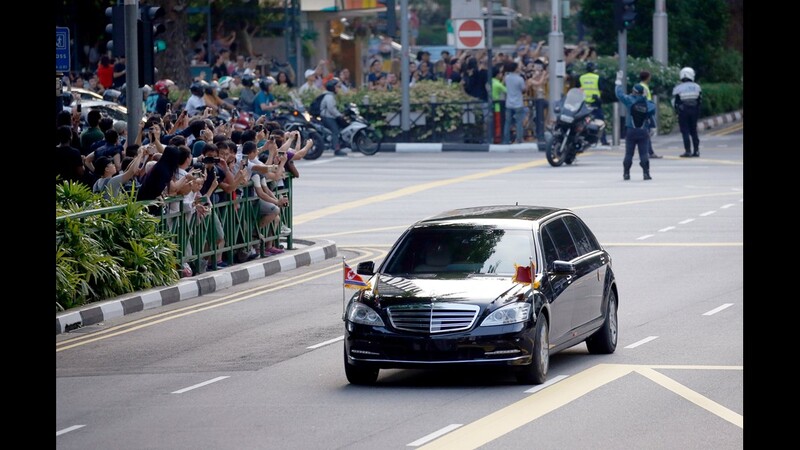 The motorcade carrying North Korean leader Kim Jong-un, drives past on the street in Singapore on June 10, 2018. The North Korean leader met with Singapore Prime Minister Lee Hsien Loong ahead of a historic summit with President Donald Trump on June 12. Erica Boland, right, a U.S. student based in Singapore and a supporter of President Trump, and her friend wave a flag as they wait for his arrival, outside the Shangrila hotel in Singapore on June 10, 2018. 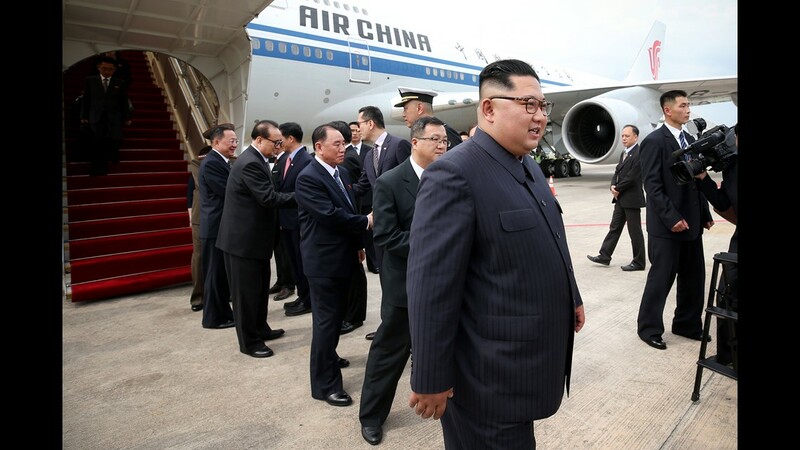 A handout photo taken by Ministry of Communications and Information of Singapore on June 10, 2018 shows North Korean leader Kim Jong Un arriving at Singapore International airport in Singapore. 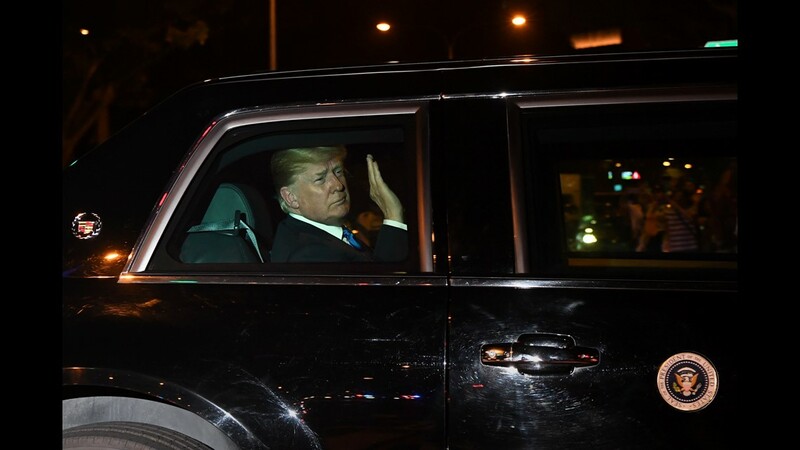 President Donald Trump waves upon his arrival to his hotel in Singapore on June 10, 2018, ahead of a planned meeting with North Korea's leader. 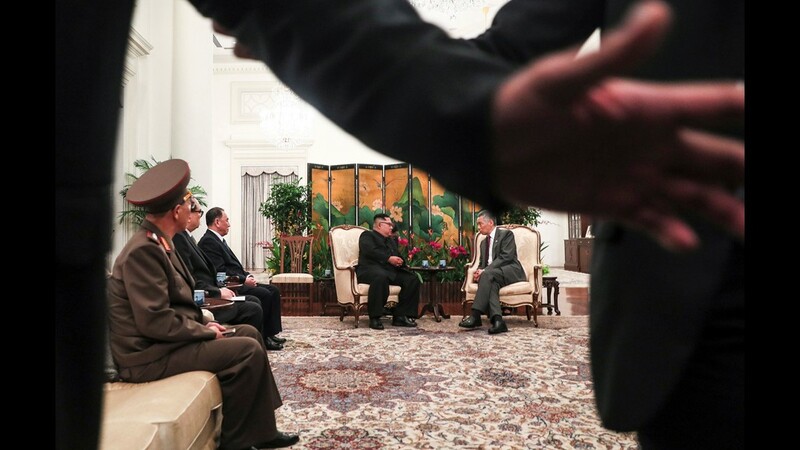 North Korean leader Kim Jong Un, center, and Singapore Prime Minister Lee Hsien Loong talk during their meeting at the Istana Presidential Palace in Singapore on June 10, 2018. 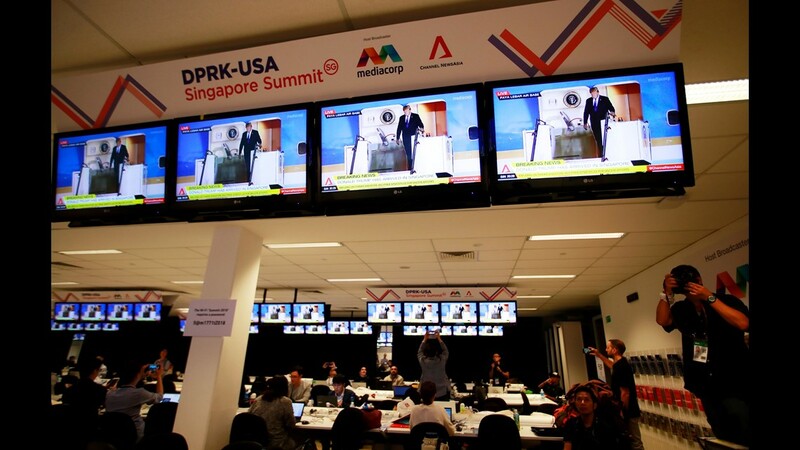 People look at President Donald Trump's arrival at the airport on TV screens in the International Media Center for the DPRK-US Singapore Summit in Singapore on June 10, 2018. 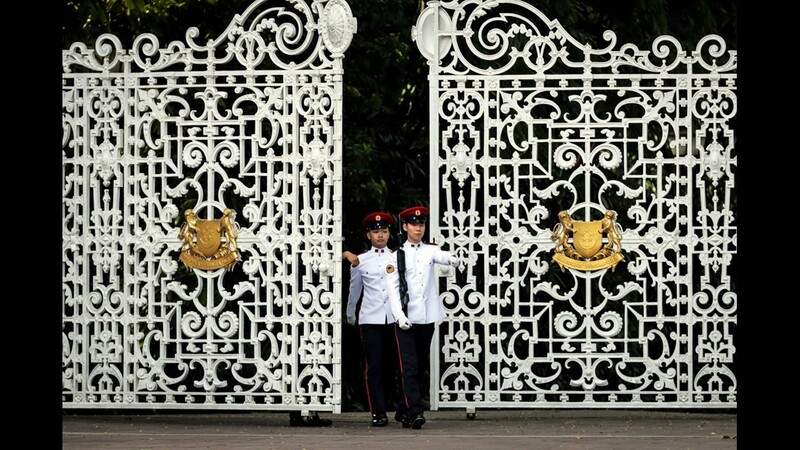 Singapore military personnel patrol in front of the gate of the Istana Presidential Palace, where North Korean Leader Kim Jong Un and Singapore Prime Minister Lee Hsien Loong will meet in Singapore on June 10, 2018. 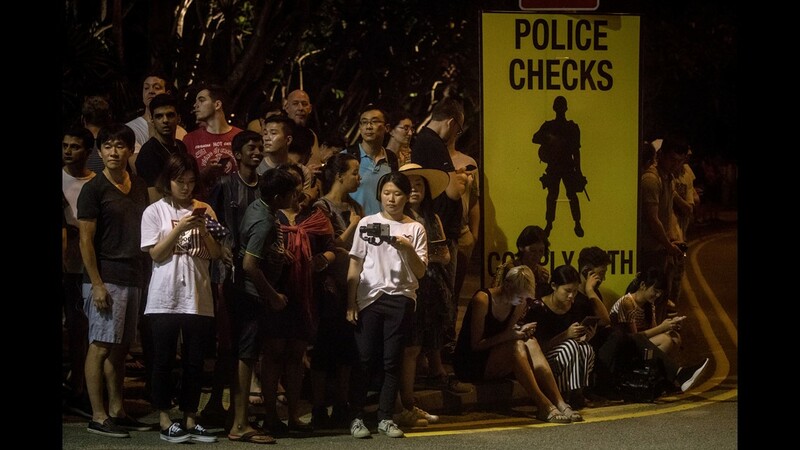 Members of the public and media wait outside the entrance to the Shangri-La Hotel for the arrival of President Donald Trump on June 10, 2018 in Singapore. "The U.S.-South Korea joint exercises and U.S. forces in South Korea play significant roles for the security in East Asia," Japanese Defense Minister Itsunori Onodera said Wednesday. Previous American presidents refused face-to-face meetings with North Korea's leadership over fears of legitimizing a totalitarian state that admitted to state-sponsored kidnapping and sent thousands of its citizens to forced labor camps. "I did it because nuclear (security) is always No. 1 to me," Trump said during a news conference in Singapore Tuesday. North Korea has taken no verified, concrete steps toward denuclearization. Wednesday in Pyongyang, newspapers ran photos of Trump and Kim standing side-by-side on the world stage and touted an "epoch-making meeting much awaited by the whole world."